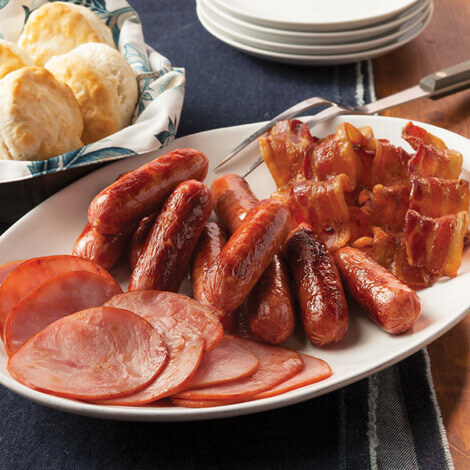 Enjoy an old-fashioned country breakfast when you add any one of these delicious meats to your early morning meal. Amana Packages are always excellent! All the packages I ordered for Christmas gifts this year were 5+ star ratings! They are well received and enjoyed by all. Delivery is excellent. Look forward to future purchases! Sent breakfast meat bundle to Florida for Christmas breakfast. Everyone loved the sausage but the bacon while flavorful was very fatty. The Canadian bacon was also tasty but would have been better if the slices were thicker. As always, the breakfast meats from Amana are delicious. There is no better bacon anywhere! 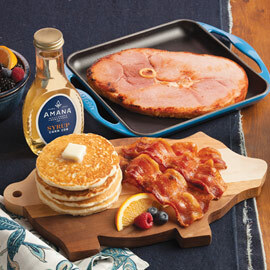 You can't go wrong with Amana sausage or bacon. Outstanding service! Easy ordering and on-time shipping. I had the Iowa meats sent to kinfolk out West as a gift and the package's content was so highly regarded that actual fisticuffs broke out among the recipients over dibs on the last remaining Smoked Maple Country Sausage Link. In the aftermath of the altercation, in which no bloodshed occurred, amends were eventually made and peace was established among the pugilists while they shared tasty brauts I had the foresight to include in the order. Love the smoked bacon and Canadian bacon. Would have made another choice if offered for the maple country sausage. Did not care for flavor or sweetness. Appreciate the ease of ordering and the speed of delivery to the recipient. I know they were able to enjoy their breakfast with family. Thanks. Very easy to order. My brother was very pleased with the package I sent him for his birthday. He remarked that the Canadian bacon was delicious and that he was saving the bacon and the brats for a family gathering. 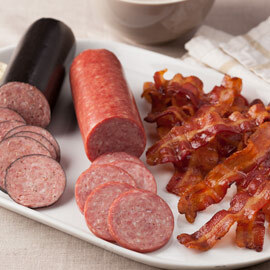 Great assortment of breakfast meats- something for everyone. Quick delivery, and it's always fun to hear from your wonderful staff! Loved it all. My in-laws were very pleased with the breakfast trio. Received the All Meat Breakfast Trio and have to tell you we loved it!! Especially loved the sausages but I'm a breakfast sausage fan anyway. Will be a future customer based on this experience. Recipient loves the product and fast service. Our Canadian Bacon and Maple Country Sausage are fully cooked and only need to be heated through. Using a skillet method with a small amount of oil is recommended. Cook the bacon by your preferred method and as desired, chewy or crispy.